What’s It About? 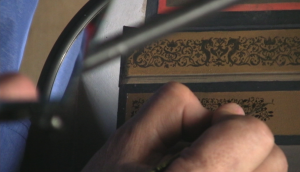 American inventor Tim Jenison attempts to find out just how Johannes Vermeer painted photo-realistically 150 years before photographs were invented. 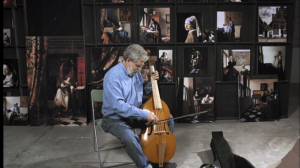 Over the course of 10 years, Jenison sets about trying to show how Vermeer could have worked, using materials and technologies available at the time, and ultimately to recreate one of Vermeer’s paintings, ‘The Music Lesson’, himself. The BAFTA-nominated documentary was written by Penn & Teller, produced and narrated by Penn Jillette, and directed by Teller. Verdict: Beginning by introducing us to Jenison, we get to see a bit of his background. He’s a charismatic and likeable guy, a video effects man whose company has picked up an Emmy or two – but not a painter. He’s friends with Penn & Teller, and it’s easy to see why they thought this story would make a good film. Tim’s Vermeer gives us a little bit of background on Vermeer, as well as showing us a good number of his works. These obviously speak a lot louder than words in showing how great he was, but Vermeer himself isn’t the main focus of this documentary. Though it is the artist’s work and the mystery around him that forms the narrative; Tim is the focus here. It’s clear from very early on in the film that the climax will be Tim’s attempt to completely recreate a Vermeer piece himself. To get to that point there’s a lot of research and immersion in Vermeer’s world. Tim travels to a town where Vermeer lived in the Netherlands, meets people around the world, and even goes to Buckingham Palace to get a private viewing of the original ‘The Music Lesson’. We see the progress Tim makes in discovering the techniques Vermeer could have used, starting with a simple camera obscura and getting more complicated with the use of mirrors. Despite the techniques getting slightly more involved, the documentary is always keen to explain, in a simple way, exactly what they are doing, and uses pretty basic images and terminology to do this. Tim also speaks to experts along the way, including British artist David Hockney (who put forward this theory himself) and an expert on human vision, to offer them the chance to support or pour scorn on his theories. To paint ‘The Music Lesson’, Tim must first create an actual-sized replica of the room, and everything in it – he even recreates a tower outside the window to give the same shadow looming over the original room. He creates conditions and materials as close as possible to those Vermeer could have used. This is a great segment, one which spanned quite some time, but is edited together well as a montage – who would have thought seeing someone sanding down chair legs could be so fascinating? Tim is clearly somebody who has a level of OCD that means every minute detail has to be exactly the same as the original room. 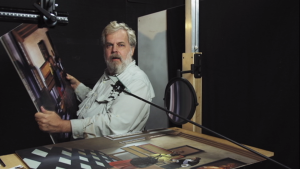 The film will always live or die on just how good the final piece Tim creates will be, and how much they can convince you that Vermeer may have used these techniques. It goes to some lengths to make clear that there is no irrefutable evidence that he did (artists of the time didn’t keep records for fear of their ideas and techniques being stolen), but they instead prove that he could have. 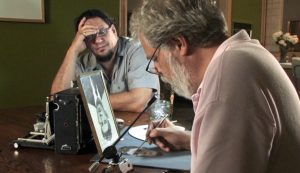 They show Tim using the methods and allow the viewer to compare the two final pieces. It isn’t a spoiler to say that the results are astonishing. There are some real moments of excitement, and breakthroughs that support Tim’s theory that will make you gasp. It feels like a great detective story where, though things just fall into place quite accidentally at times, the case does get stronger and stronger. As well as shocking moments and moments of awe, there’s a good deal of humour thrown in. There’s one scene, many days in to creating ‘The Music Lesson’, when an exasperated Tim just deadpans to camera, ‘It’s like watching paint dry’. But luckily watching this documentary isn’t. As well as being informative, it is entertaining to watch, like a very elaborate and important episode of Mythbusters. At just shy of 80 minutes, the film does fly by. Though the film does put forward its own convincing case, perhaps a little more time could have been spent on the counter-argument, and on emphasizing how, if true, it makes Vermeer all the more fascinating and genius. That is a very important point to make. Tim isn’t trying to trash the reputation of a great artist. His reaction on completing the painting shows just how much respect he has for him. The involvement of Penn & Teller did mean there was always a slight scepticism at the back of my mind – could this really all be true? But there is no rug-pulling moment, and the results are incredible. Extras: The DVD is stocked full of extras – there’s commentary from Jenison, Jillette, Teller and Farley Ziegler, over two-and-a-half hours of deleted and extended scenes, and a Q&A filmed at Toronto Film Festival. Final Words: A moving documentary that is a must-watch for both art and history fans as well as those who don’t have a particular interest in the subject. The aim of a good documentary should be to make something accessible, informative and interesting to somebody who has no existing knowledge or interest in a subject, and this is definitely a good documentary. Following a very likeable man in Tim Jenison, this will no doubt have you rooting for him and will genuinely leave you open-mouthed and full of wonder.